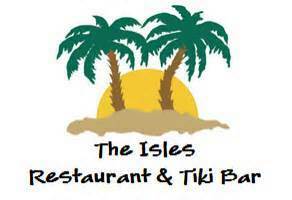 If you are seeking to enjoy oceanfront dining at an award-winning restaurant in Ocean Isle Beach, you need look no further than The Isles Restaurant and Tiki Bar. Serene ambiance and panoramic ocean views surround you as you enter; the sweet strains of island music beckon you to relax and stay a while. Open for lunch and dinner, The Isles Restaurant serves up fresh seafood, the choicest beef cuts, delectable pastas, and much more all made with the freshest of regional and seasonal ingredients. Looking to take that special someone out for a romantic dinner? The Isles is the epitome of Ocean Isle Beach’s romantic dining settings. Or maybe you are having a wedding reception, hosting a banquet, or having a corporate function. With a special event area that boasts a capacity of 150 people sequestered from other sections of the restaurant, the friendly, professionally trained staff at The Isles can accommodate your every need. The beautiful white sand expanse fronting The Isles Restaurant is also an exquisite place for a picture-perfect ocean side wedding; everything you need for your special day is available including audio/video equipment, projector and screen, DVD/VCR player, Wi-Fi, and wireless microphones. The Isles Restaurant has something for just about any taste, making it very popular among restaurants in Ocean Isle Beach. Featuring an extensive menu, everything on it is so good it can be hard to choose! Appetizers such as Bacon Wrapped Sea Scallops, Smoked Wahoo Paté, Tuscan Bruschetta, and Lump Blue Crab Cake are just the beginning. The Isles offers many freshly caught seafood specialties including Caribbean Inspired Mahi, Grouper Creole, Isles Grilled Platter, and Jambalaya. If seafood is not your thing, there are a number of excellent steak, chicken, pork and pasta creations. Vegetarians, you haven’t been forgotten. The Isles has several excellent meat-free dishes and a host of delicious salads that you’ll love. You can expect reasonable prices ranging from $6 to $27; most entrees average about $20. From the Ocean Isle Beach Pier, go through the traffic circle and head west on West 1st Street (Route 1144). Turn right at Charlotte Street. Charlotte Street will curve to the left and become West 2nd Street (Ocean Isle W. Boulevard). The Isles Restaurant and Tiki Bar in Ocean Isle Beach is approximately 1/3 of a mile down West 2nd Street on the left.